We don't have Netflix at our house. So when I saw this I had to have this! Brings back memories and the price was way too good to pass up. 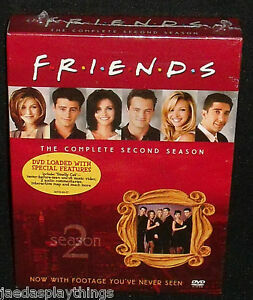 What was the question on Friends minds from 1994 to series end in 2004...Will Ross and Rachel be together? It was this season where the question becomes a favorite topic among Friends fans. While the question of Ross and Rachel's relationship becomes a dance between two who don't even know they're dancing, the remainder of each episode lives just a bit to be desired. If there was one slow season in those ten years, it would have been Season 2. Irregardless, the episodes still remain fresh and punch lines not only funny, but hilarious. Season 2 is absolutely a must include for Friends fans wanting to watch the show again and again....long after the late night reruns have bid their farewells. The one with.... is so funny!